Despite dire predictions to the contrary, knitters in both Peru and Bolivia continue to create amazing work. 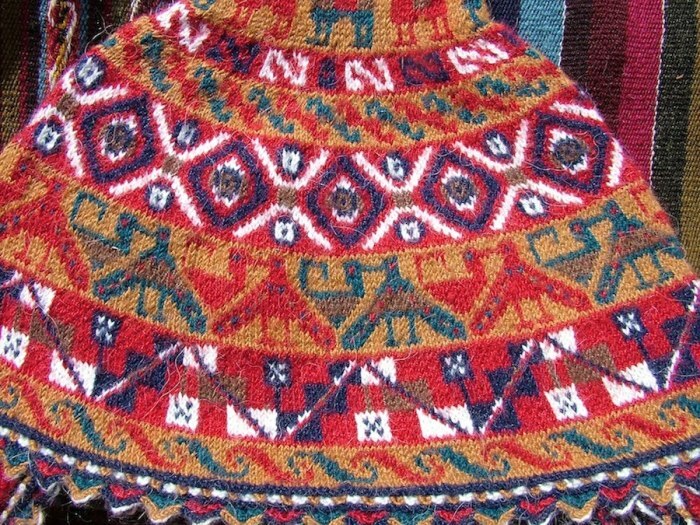 In fact, in many areas, Andean knitters now knit with finer stitches and more complex patterns than in the past. 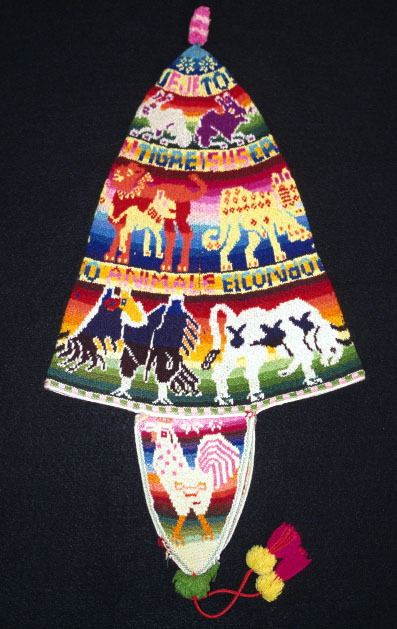 They use tiny stitches and complex techniques that are often unknown outside of the area – techniques so unusual that when I wrote Andean Folk Knitting: Traditions and Techniques from Peru and Bolivia, I had to invent names for them! An infinite variety of intricately-patterned caps, called chullos, are the most common traditional knitted items, but Andean knitters also make beautiful sweaters and accessories. During a trip with Behind the Scenes, you and I will visit remote villages where we will meet knitters and spinners (and weavers and dyers too) to see examples of their exciting work and to learn about their techniques. In many places, you may buy things directly from the people, which helps them to improve their standard of living. In most of the Andes, only men wear the knit caps or chullos, except for a couple of places where little girls wear a ruffled version. Men often knit the caps too, for themselves and their sons, using a set of five very thin double-pointed needles. Because many villagers live far from markets where they could buy factory-made needles, they often make their own knitting needles out of baling wire. They cut lengths of fine, semi-rigid wire, straighten the pieces, then file hooks into the ends. The hooks make it easier to pull up the stitches on their very fine, tight work. 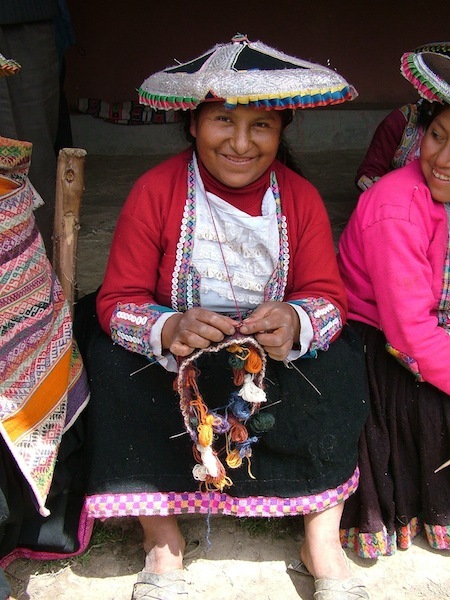 Nowadays, the men make their own traditional caps from factory-spun synthetic acrylic yarn, manufactured either in Peru or Bolivia. These colorful yarns are fine, inexpensive, and available in local markets in a wide range of hues: a logical choice for people who otherwise would have to round up a sheep or alpaca, shear it, then clean, spin and dye the wool, before even beginning to knit. 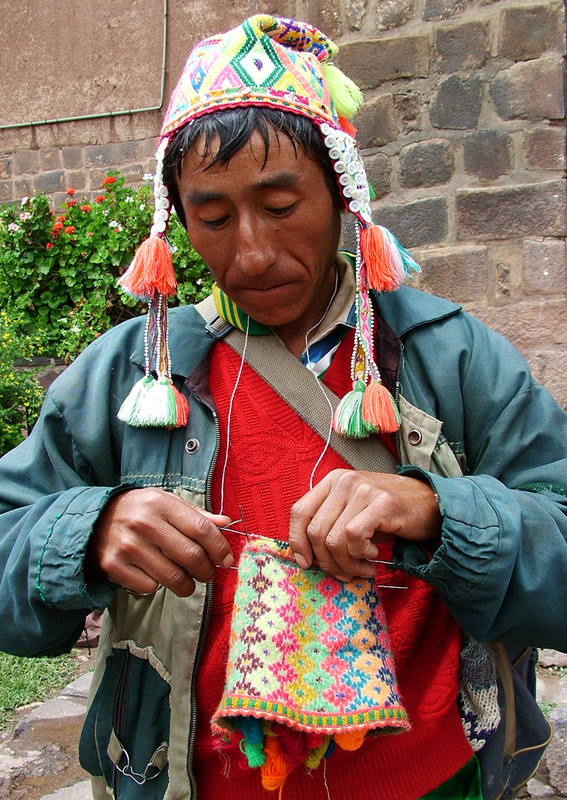 Andean knitters work with four needles arranged in a square, pulling up stitches with the fifth needle. They usually work in stockinette stitch around in a spiral, called “circular knitting.” The knitter working on the cap above is using thirty-two separate little balls of bright acrylic yarn, eight color changes per needle! Occasionally knitters make colorful patterns with knit and purl stitches, for example the purled checkers done in different colors around cap edges or earflaps. However, most patterning is done with color changes, often in intarsia techique. Bolivian knitters in particular don’t like any floats on the insides of their caps; as they work, they twist the working yarn with the running yarn at every stitch, so that the inside of the cap is almost as pretty as the front. See the colorful example at left. Note that this masterpiece has three colors carried all around it, in very complex color and motif arrangements! In some areas around Cuzco, Peru, knitters have been encouraged to use sheep’s wool or alpaca hair with natural/organic dye materials. In these same areas, knitters make charming children’s caps, embellished with hand-worked “popcorns,” finger-crocheted into the yarn and pulled through to the front of a finished cap. The knitters typically pass the working yarn around their necks to maintain an even tension and in many places, they work from the inside and purl all the stitches. Andean knitters have invented many earflap variations and and many unusual methods for joining the different colors of yarns as they knit. These are too complex to explain here, but if you join us in the Andes, you will see these marvelously talented knitters (as well as weavers, spinners and dyers) at work. You can even sit down at their feet in the grass and ask them to work more slowly, like Mary Jane Mucklestone does, to learn their techniques!